Robots designed by area teens face off in the FIRST Tech Challenge at Greens Farms Academy. WESTPORT — Competitive sports offer thrills and spills, but a championship event Saturday at Greens Farms Academy helped lay groundwork for the professional playing field. 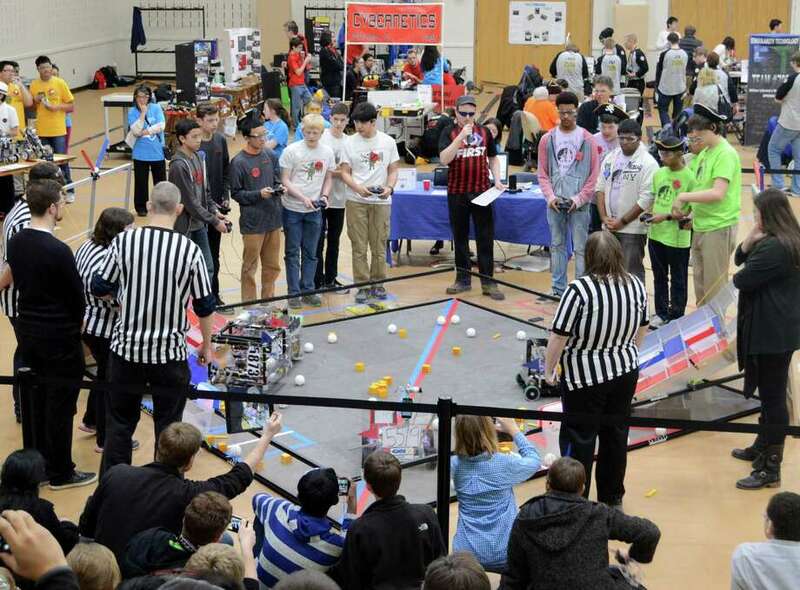 The annual Battle at the Beach attracted 24 robotics teams of teens from around the state, sponsored by FIRST Tech Challenge. Competitors collaborated on a robotics project designed to build engineering and tech-design skills and to promote cooperation. Nina Rodgers, 17, of Fairfield, a longtime member of the Dragonoids team at Greens Farms Academy, plans next year to attend Northeastern University and study mechanical engineering and aerospace. “This team really inspired me,” said Rodgers, who had the chance to work with tools and developed a deep interest in the construction process. “The building component is really the interest that I have,” she said, noting competitions such as Saturday’s event have also given her the chance to interact with others who have similar interests. Connecting with other teams is an important aspect of the competition, according to organizers. Students not only succeed by creating and manipulating the most effective robot, but also by demonstrating a readiness to help other teams where they’re needed and to form coalitions with others. “The first motto is ‘gracious professionalism,’ ” said Evan Barnet, director of the competition. Awards given to competitors recognized not only include abilities to design and direct robots, but teamwork, connections made with the engineering community, and strength in building alliances with other teams. Barnet said these skills not only promise to be of value in the working world, but can play an important role in college success. “And this is the type of hands-on experience that engineering companies are looking for,” he added. Inspire Award Winner and Winning Alliance Captain: i2r robotics, Westport; Inspire Award, second place: RoboEpic, Greenwich Academy, Greenwich, and Winning Alliance, first: Dragonoids, Greens Farms Academy, Westport. The event organizer, FIRST Tech Challenge, in partnership with colleges and universities, offers scholarships. For more information, www.firstinspires.org .